An evil King Washington and Native American superpowers fit into the story. 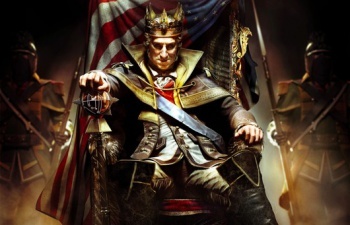 After the Revolutionary War, there was a great deal of concern that George Washington would become a tyrannical monarch no better than King George III. This didn't happen of course, but Assassin's Creed III wants to explore what would happen if it did in its next DLC pack. If you follow the series, you probably already knew that, but here's what's new: The Tyranny of King Washington will be a canonical part of the Assassin's Creed story - and protagonist Connor will get some Native American superpowers, to boot. Since the Assassin's Creed story has generally cleaved to real history as closely as possible, making a fictional scenario part of the overarching narrative may sound strange. Marc-Alexis CÃ´tÃ©, ACIII's director, promises that Ubisoft's commitment to historical accuracy hasn't changed in spite of some DLC weirdness. "By the end of the last episode you will see how this relates to Connor and the real George Washington," he says. "This experience is canon." As with most Assassin's Creed games, The Tyranny of King Washington will invite players to solve a meta-mystery about the story by hunting down glitches in the Animus: the sci-fi system which allows series protagonist Desmond to relive the memories of his ancestors. "[Solving the mystery] requires an investment from the player to discover and to believe that answer." Since the DLC is already playing fast and loose with historical fact, it will also grant Connor some unusual superpowers along the way. These superhuman abilities are rooted in Iroquois myth: a wolf cloak of invisibility, flying like an eagle, and short-distance teleportation (although this writer is not sure which native story involves the last one). Connor will gain these powers after a hearty swig of hallucinogenic tea, which a Native American consultant deemed less offensive than a trip to the sky world by way of animal-inscribed spirit stones. "It's something that we've been really sensitive to throughout the development of the game, respecting the culture of the people we portray," insists CotÃ©. CotÃ© explains that the rationale behind this story won't just be "it was all just a dream," so players who invest in all three DLC installments should get an interesting resolution. Experiments like this are arguably one of the reasons why Assassin's Creed works better as a hybrid sci-fi/history story rather than just one or the other, but it will be a few months before gamers can gauge the quality of this unusual twist.